Chances are you’ve heard a lot about the volcanic eruption of Vesuvius and how it destroyed the ancient city of Pompeii in A.D. 79. The excavation of Pompeii’s extraordinary treasures in the 1700’s ignited a fascination with all things Pompeii. Archeologists unearthed cultural objects that opened a window to the past; showing us how ancient Pompeian’s lived and died 2,000 years ago. But at a preview of The Last Days of Pompeii: Decadence, Apocalypse, and Resurrection, I discovered that the Getty’s new exhibition is actually more about the present than it is about Pompeii’s historical past. Unlike previous exhibitions about Pompeii’s ancient artifacts, this exhibition explores how Pompeii has been imagined in works of art created after its rediscovery. Diverse works by leading artists (including Duchamp, Dali, and Warhol) reflect and reinterpret our modern day obsession with Pompeii, like Gormley’s take on the famous body casts of Vesuvius’ victims (above). Even the Museum itself is a replica of a villa destroyed by Vesuvius, reflecting J. Paul Getty’s own desire to reimagine ancient Roman life. Seeing this terrific exhibition in the unique setting of the Villa Museum’s Vesuvian-inspired architecture is an experience not to be missed. I took my children (8 years & 10 years) to see The Last Days of Pompeii exhibition last week. They’re boys so they jumped at the chance to see something about a volcanic eruption and ancient Rome (the Percy Jackson and the Olympians books have really sparked their interest in mythology). On this trip, I let my sons take the lead as we explored the galleries. [Parent’s Tip] They seem to like our museum visits best when they can navigate their own path. Plus, it’s interesting to see an exhibition through their eyes. I always discover new things about the museum and my children. They started the exhibition in the middle gallery labeled Apocalypse (neither felt the need to start at the beginning of the exhibition like I do), and went straight to a monitor showing Pompeii-themed film and televisions clips. The exhibition has several of these montages with everything from silent movie clips to Scooby-Doo cartoons. I was worried my sons would watch only the clips; but they did look at art too, including different works than those that caught my eye at the preview. I pointed out Warhol’s Mount Vesuvius painting (above), but my 10 year old son took a quick glance and walked right by it. 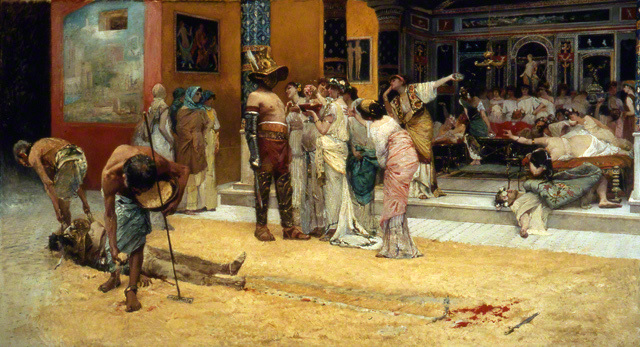 Instead, an image of a Roman soldier captured his imagination in Poynter’s painting Faithful unto Death. In the painting, the soldier remains on guard even as volcanic forces destroy the city around him. I wondered how I missed this haunting portrayal the first time. He became equally transfixed by Netti’s painting Gladiator Fight during a Meal in Pompeii (above) in the gallery labeled Decadence. My younger 8 year old son gravitated toward the exhibition’s multi-media stations. In the final section Resurrection, he found an interactive installation about Pacini’s operaThe Last Days of Pompeii. He listened to opera excerpts while looking at the set designs and costumes in the original prints on display. 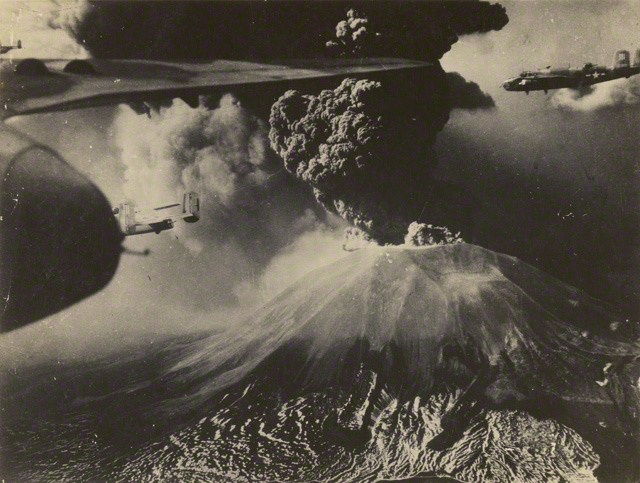 Then he discovered historical photographs of the accidental bombing of Pompeii during Allied air raids in World War II (above). This interactive display allows visitors to toggle between “before and after” images of the archeological site – from a photograph of the war damaged archeological site to a photo of the site’s post-war reconstruction. I recommend this exhibition for children 8 years and older. Pompeii was a catastrophic natural disaster so you might want to use some discretion with young or sensitive children. For these children, the Family Forum is a great alternative — an fun interactive space just for kids with lots of hands-on activities about the world of ancient Greek vases. 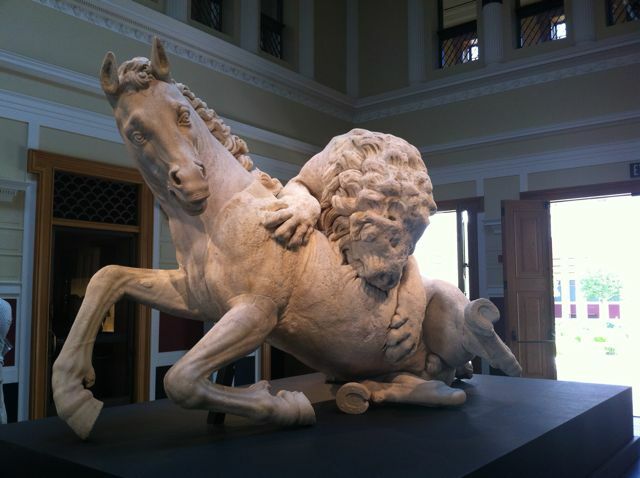 Before you leave the museum, be sure to see the stunning installation of the Lion Attacking a Horse marble sculpture (325-300 B.C) on loan from Italy until May 6, 2013 (above). My sons loved trying to figure out which parts of the ancient sculpture were restored by Michelangelo’s student in Rome (see behind the scenes Getty video about the installation). Family Festival: Mark your calendar for the Villa’s upcoming Pompeii Family Festival Sunday, December 2, 2012. Plan Your Visit: The exhibition is on view September 12, 2012 – January 7, 2013. Click here to make free online reservations. Pierre-Henri de Valenciennes. 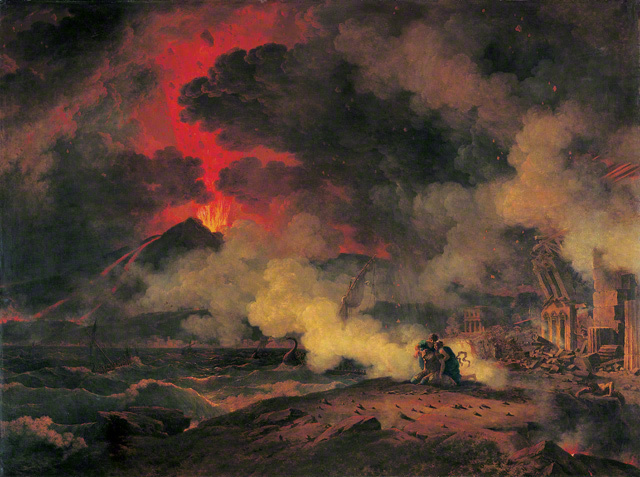 The Eruption of Vesuvius August 24, 79 A.D., 1813. Museum of Fine Arts, Boston. Andy Warhol. Mount Vesuvius, 1985. Andy Warhol Museum. Lion Attacking a Horse installation at the Getty Villa Museum. Photo by Museum Stories. Great blog! I’m the Ed Specialist for family programs at the Villa and just wanted to say thanks for this wonderful parent-and-kids-eye review of Last Days of Pompeii.